It’s a sign that I’ve read too much Harry Potter; I now think of this as the Riddle House. It’s not, of course, but in my mind, when I read The Goblet of Fire and the passage, “Once a fine-looking manor, and easily the largest and grandest looking building for miles around, the Riddle House was now damp, derelict and unoccupied,” I think of Ridley Hall (link: Canada’s Historic Places). 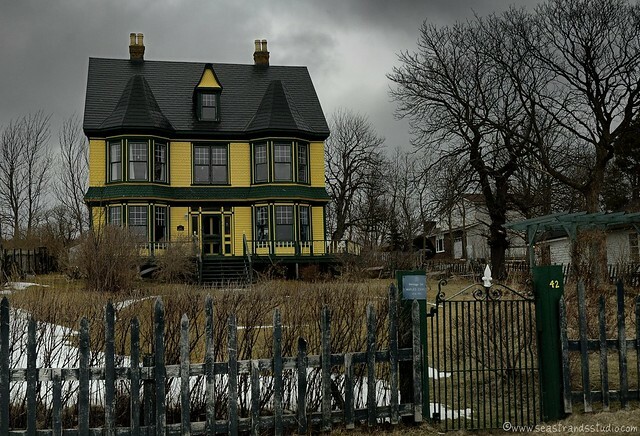 Or rather, I think of Ridley Hall (link: Heritage Foundation of Newfoundland and Labrador, registered heritage structures) as it was before the fire in 2003. It was built in 1834 by Thomas Ridley, a merchant of some import and influence in the area. Upper window in Ridley Hall. The blurred lines against the dark are flecks of snow. Today it is in rough shape. When you look at these photos, keep in mind that at all times, I tried to line at least one vertical or horizontal line of the building up with the edges of the photo, so if something looks skewed, it is. If a stone wall give the impression of bowing inwards or outwards, it probably is. 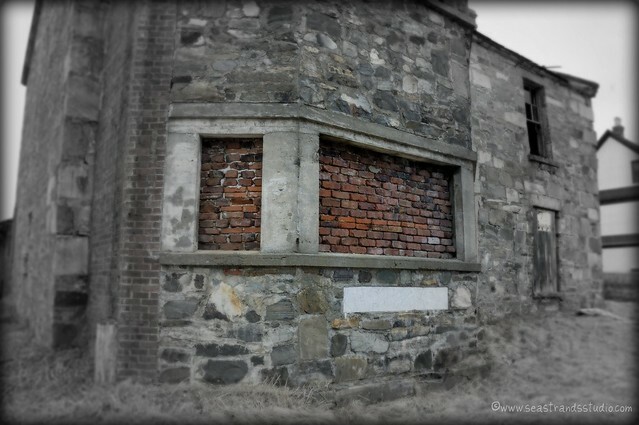 Bricked-up windows keep out those who might venture in and add a little structural support.. 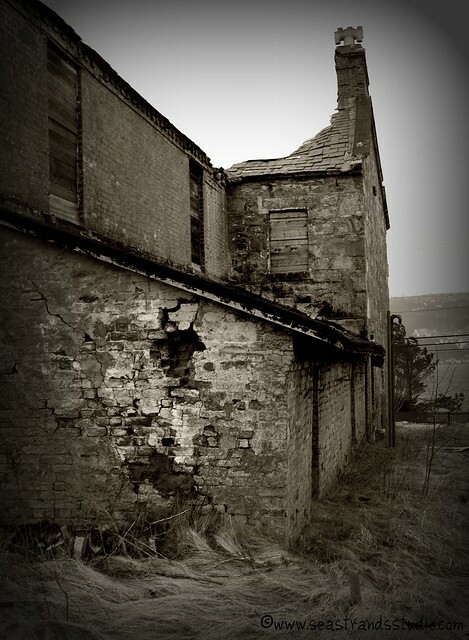 It would be incredibly dangerous to go inside now as all the upper stories have collapsed and the roof slates are prone to succumbing to gravity. A view along the side. 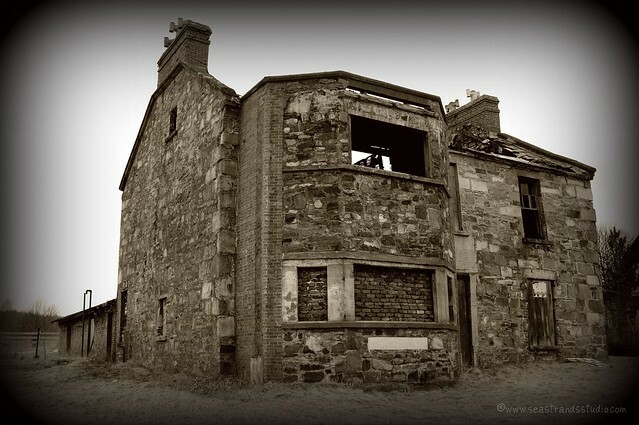 You can see the crumbling stonework and the tilt of the chimney. 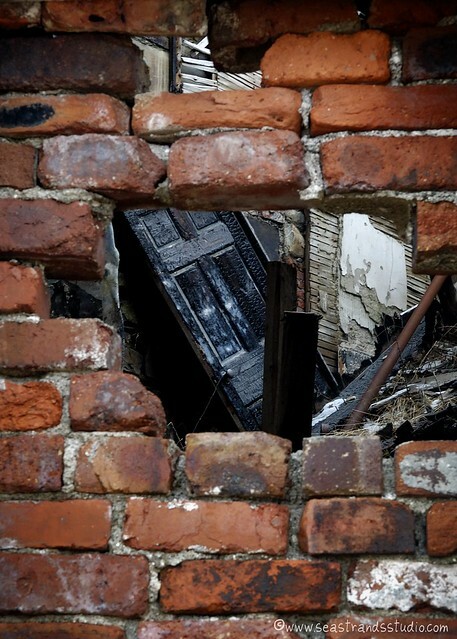 A view through a hole in the bricked-up front window reveals the fallen second story and a charred interior door. Desolate and hoping for a new life. Ridley Hall made the list of endangered heritage structures this year. 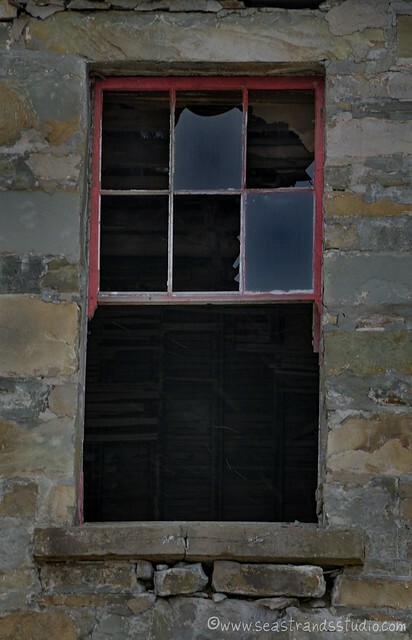 I have heard that before the fire, the owners (who do not live in Newfoundland) had plans to restore it. Vandalism has put a severe damper on those plans. Maples Estate, directly next door to Ridley Hall. A real study in contrasts. So that was a part of our adventure on Sunday. I’m still working through the images from the rest of it and finding time for that this week is proving to be an interesting adventure in and of itself! For two other trips that we took to Harbour Grace, have a look here, for a trip of general exploration, and here, for a visit to the Fairy Ring! Woah! These are brilliant! The mood, the warmth of them all, and the eye here are all very good.